Ok, so I’ve had to shift gears regarding the commuter bike project because the old Trek was just the wrong size frame. 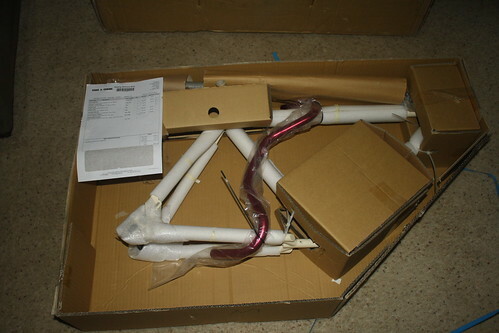 I ended up selling off that old Trek and buying an On-One Pompetamine frame/fork. This is a steel 700c road bike with track dropouts and disc brake mounts. It goes so far with the disc brake mounts that they’re the ONLY brake option for this frame. 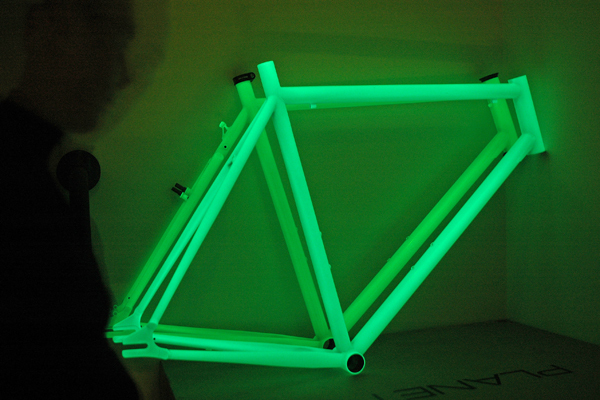 I bought one in a glow-in-the-dark paint scheme (the fork was not available in that color, so I went with black). I ordered it a couple weeks ago as a pre-order. It’s a good thing I did because it was only in stock for a couple of days before being available on pre-order again. I got notice that my order shipped (from the UK) on Tuesday last week. I was a little confused when I came home from work to a note from USPS that I missed an Express Mail parcel earlier in the day. This was the only order I was waiting for, and I was told to expect it in about 16 days. It was only 6 days after the shipping notice so I wasn’t sure what to think. Later in the day, the postman stopped by again to check if I was home. 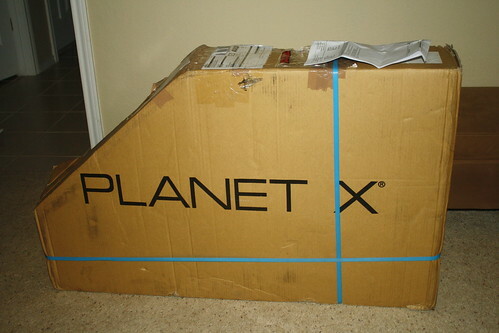 No kidding…the bike was here already. I cracked open the box to examine the contents. Everything looked in proper order. 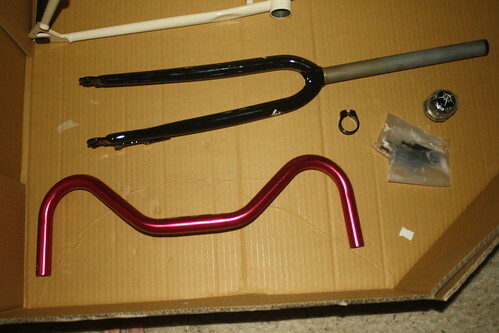 I’m going with a red/white/black color scheme for this bike. I’m kinda stoked about the mustache bars, too. They’re very comfortable in my hand. I got the Mungo bars from On-One. 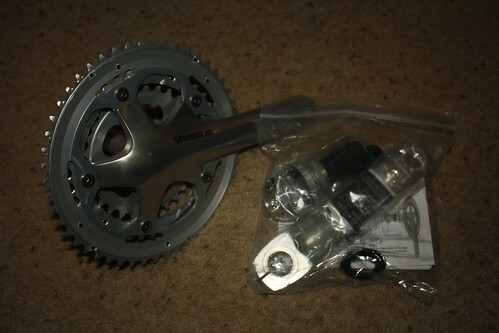 I also picked up a headset, a chain tugger, and a seatpost collar. And here’s the bread ‘n butter of the order: The frame, in its creamy white daytime disguise. I’m using the mtn version of the BB7’s because they give me the option to use mtb levers on a flat bar if I so desire to swap them out. There are options for long pull road levers, so I really have the most options here. 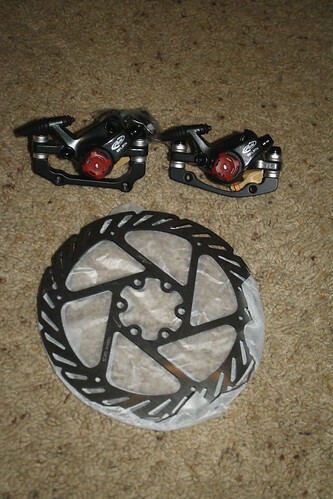 Even though I prefer the feel of hydraulic disc brakes, the BB7’s are solid performers at an affordable price. Plus, I can geek them out with red cable housings cheaply and easily. The last big purchase I need to make is a wheelset. I’d really like to have an internal gear hub, since that’s really what this frame is designed for (in particular the Shimano Alfine system). For the most part, those are out of my price range. I MIGHT get lucky and find a deal, but if not I will rock this bike as a singlespeed while I stay where I am. It’s not too hilly for SS here as long as I choose my gearing well.